Stand at attention! Chin up. Chest out. Shoulders back. I said shoulders back! Even if you've never served in the military I'm sure you've heard these instructions before. But have you ever considered the reasoning behind them? Part of it is to project a strong image of pride and confidence. We all want to project that image, right? Well, then why is every other person in the gym walking around with their shoulders rolled, their chest hidden, and their head leading the way? The main reason is because we all love to develop the muscles we can see in the mirror. 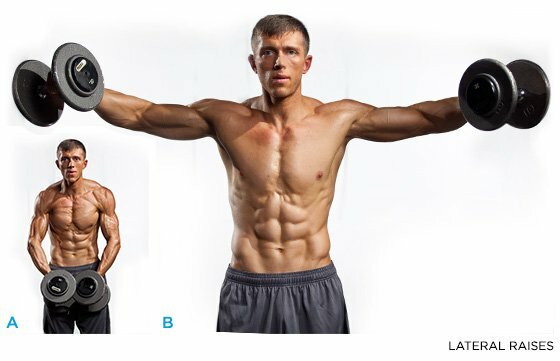 In the upper body, this means pectorals and front deltoids—muscles that are usually fed with a heavy program of pushes. The solution to this imbalance that pulls you forward is to start pulling back. Look hard at yourself and honestly evaluate your physique. Borrow a second set of eyes if necessary. Are all three of your deltoid heads equally developed? And how long are you going to deal with that shoulder pain before you take the necessary steps to correct it? These are important questions. Here's how you can work toward an answer. Who Cares About Rear Delts? The shoulder is the most mobile joint in the body, and this makes it highly prone to injury. If you've done resistance training for any amount of time, chances are you've had shoulder problems. Most likely these problems involved the four small muscles that constitute the rotator cuff. These muscles lie covered by your deltoids. Effectively working your rotator cuff is time-consuming, tedious, and no one has ever been rewarded by someone saying, "Dude! Your infraspinatus are looking diesel." Nevertheless, keeping your rotator cuff healthy is a worthy effort. The rotator cuff tendons, in front of your shoulder, run between your scapula and humerus. This narrow passageway becomes even tighter if your shoulders are pulled forward. Repetitive shoulder motion can cause the tendons to rub on the bones, which causes inflammation of the tendons, producing what's called "impingement syndrome," or rotator cuff tendinitis. Many strong people have been put on the shelf by this condition, which makes it incredibly painful to reach overhead or behind the back. Some, like me, saw surgery as their only route—although more recently, I've also been impressed by the results I saw from Active Release Therapy, as I wrote here. Bad posture increases the likelihood that you'll develop impingement syndrome, and two major culprits for your slouch are the muscles of the chest and the front deltoids. These two powerful beach muscles pull you forward into an immobile letter C, when you should want to be straight as an I and broad as a T! On top of the physical problems caused by the forward shoulder position, let me point out some aesthetic concerns. One of the main reasons we train is to improve appearance, and one of the simplest ways to instantly improve appearance is to improve posture. A person who stands and walks correctly conveys an athletic appearance, broadcasting power and confidence. It is sad how many guys put forth so much effort in the gym—only to undermine their appearance by building an unbalanced physique. But you'd better believe it's common. Once you learn to see bad posture, you'll see it everywhere, from dudes on the street to top movie stars. "But I row!" you say. That's great. But it's only a drop in the bucket compared to all the work you give your chest and front delts. I'll be blunt: You probably overwork your chest, period. But any time you work chest with any pressing moves with barbell or dumbbells, you also hit your front delts. Bodyweight moves like push-ups or dips recruit your front delts as well. If you're building your triceps with close-grip bench presses, you hit the front delts hard. Even doing curls for biceps involves them to some degree. Keeping these facts in mind, do you really think you need to do any direct front deltoid work? I think not! Right now, the meat of your shoulder work probably revolves around some form of overhead press. It is said that military presses work all three heads of the deltoid, so you probably think it's the key to building balanced shoulders. However, I say that due to the position of your elbows, your middle and rear delts probably have little to do with pressing a weight overhead. By far, the front delts are the primary head involved. Because your triceps assist in the movement, you can push a lot of weight this way. All this together translates to huge front delt development. For this reason I suggest you keep military presses to a minimum if you're looking to keep your head on top of your shoulders. And if you still do behind the head militaries, find yourself a good orthopedic surgeon. Unlike the rear delts, you can see your middle deltoids to some degree. 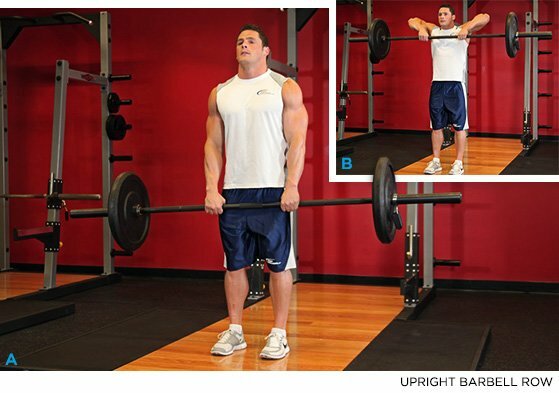 They add width to your shoulders, and for this reason, many bodybuilders and trainers give them some direct work. However, when they do this via military presses, upright rows, and lateral raises, they more than likely still use front delts as the primary movers. Fortunately, in the case of the latter two exercises, this can be improved with slight variations in hands and arm placement. Uprights Rows: Taking a narrow grip on the bar causes wrist problems and brings your elbows forward, which recruits more of the front delts. The correct way to work your middle deltoids with uprights rows is to take an overhand grip on the bar just outside of your thighs. Drag the bar up along your body until your elbows are at shoulder height. If you can't pause the weight at the top, it's too heavy. Keep your elbows in line with your shoulders and don't let them drift forward. Lateral Raises: Grab two dumbbells and stand with your knees unlocked. Bend slightly at the waist and hold the bells together in front of your body, palms facing in. With your elbows slightly bent, raise the bells straight out to the sides and pause at shoulder height. Make sure your thumbs always stay lower than your little fingers. Resist the tendency to involve the front delts by letting your hands drift forward or raising your thumbs. Your rear deltoids are inherently smaller than the middle and front delts, so they start at a disadvantage. Add to that their position behind the shoulders—i.e. out of sight—and it's no wonder they're ignored. Despite this, I cannot overstate the importance of strong rear deltoids. They need to have the power to pin back the shoulders, counteracting the pull of the front delts and the weight of the heavy chest muscles. Well-built rear delts also complete the look of mighty shoulders and a powerful back. Training them, however, will involve turning off your pride and becoming blind to numbers. If you're man enough to face that, then here are three great ways to get your rear delts up to snuff. Check your ego and grab a pair of light dumbbells located way down the end of the rack in No Man's Land. With your knees unlocked, bend way forward, almost parallel to the floor. Some people find it easiest to rest their head on the back of an incline bench. Let the bells hang down, with your palms facing your knees. Keep your arms straight; raise both bells out to the side; keep them in line with your shoulders. It's important to keep your thumb side straight down. Raise them as high as you can for a quick pause. If you can't pause the bells at the top, they're too heavy. Remember to control the negative for a slow descent. Sometimes I'll get about eight reps using strict form, and then I'll continue the set by slowly straightening my torso up with each rep, letting my middle delts assist my rears, until I'm almost standing straight up. Bent-over laterals can also be performed while lying face-down on a flat bench or an incline bench at a low angle. I like to use the rear delt machine because it keeps the rear delts under tension throughout the entire rep. The seat should be adjusted so your arms form a horizontal line, but sometimes I start with the seat about three inches lower and raise the seat up one position with each set. If you want to isolate your rear delts, use the horizontal handles. If you want your middle delts to also get some work, you can use the vertical handles. Sometimes I'll rep out with a horizontal grip and continue the set with the vertical grip. Knowledgeable powerlifters and other heavy benchers have long been using face pulls to hedge their Neanderthal leanings. It's known to be one of the best rear delt and rotator cuff strengtheners, but it also gives your middle delts a serious workout, so do these without reservations. 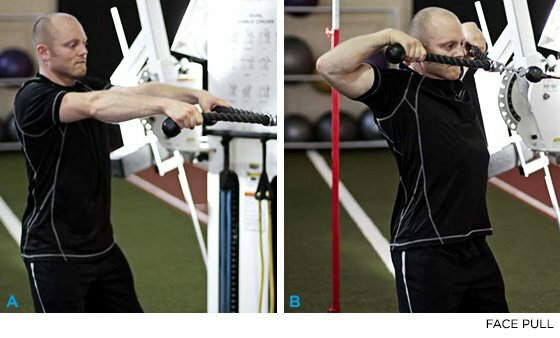 The most common way to perform a face pull is with the triceps extension rope, using a neutral (palm-to-palm) grip. If you're serious about your correction work, you could also do them at home with an elastic cable, band, or a suspension system. In any case, getting a full contraction is far more important than pulling a heavy weight. If the weight you pull is heavy enough to make you unstable or cause you to lean forward, you're probably better served by going lighter. Move with a slow, controlled tempo. The face pull with external rotation adds a deep scapular retraction to the classic movement, further supporting your backside against the pulling forces up front. To perform it, pull back into a normal face pull, then rotate upward into something resembling a double biceps pose—you know, the one you do after brushing your teeth every morning. You can perform the face pull and external rotation in two distinct phases, or pull straight into the rotation. Either way, it'll get some muscles you probably neglect, so expect to feel it the next day!